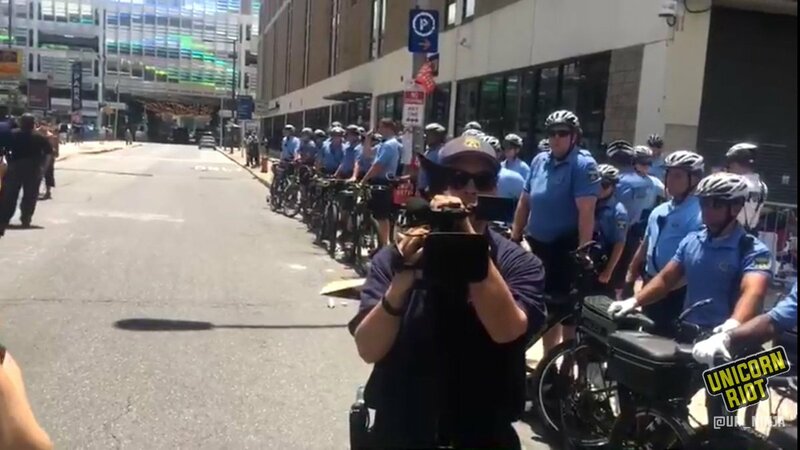 All photographs and/or recordings taken on July 5th, 2018 at the Occupy ICE camp (near the Immigration and Customs Enforcement office in Center City). "Hundreds of protesters who withstood extreme heat and thunderstorms over four days served as Philly’s version of what’s become a national movement calling for the abolition of Immigration and Customs Enforcement by camping outside federal offices to “Occupy ICE” — a name that harks back to Occupy Wall Street, the 2011 nationwide protest against corporate greed that some say ushered in today’s Democratic Socialist movement. I would kindly request that any responsive photographs and/or recordings be delivered in their original/unedited form. Thank you for your correspondence. This is an automatic response to let you know that the City will process your request and respond further within 5 business days of its receipt by an Open Records Officer. Please note that requests received after 5PM are deemed received the next business day. If you do not receive an email within 5 business days, please contact the City immediately as occasionally a requester's spam blocking service interferes with the delivery of our emails and we are not aware of the issue. Did you know that the City already releases a lot of information and open data online? You might be able to find the answer to your inquiry right now! Search for a property's L&I related permits, licenses, violations, and appeals with the L&I property history tool. Search for a property's Real Estate Tax Balance with the Revenue Department's tax real estate lookup tool. Find all of the City of Philadelphia's open data sets on Open Data Philly, the Philadelphia region's open data portal. Search information about professional service contracts online at eContract Philly. Search information about procurement contracts online with PHL Contracts. Search City legislation and related hearings online with Legistar. Obtain financial disclosure forms from the Department of Records. If one of these sources has solved your inquiry, please let us know! Otherwise, thank you for your patience, and we will be in touch soon. Sincerely, The City of Philadelphia Please Note: To help make sure that future emails from us don't end up in your spam or junk folder, please add this email address to your safe sender list. Attached to this correspondence is the Philadelphia Police Department's 5 day acknowledgment to your right to know request. I wanted to follow up on the following Pennsylvania Right to Know Act request, copied below, and originally submitted on July 9, 2018. Please let me know when I can expect to receive a response, or if further clarification is needed. The City is continuing to process your attached request, but requires additional time to do so. The City is currently processing a very large amount of Right to Know Law requests and appeals, which has considerably strained our capacity to respond. Would you please grant the City a three (3) week extension of time, until 9/6/18, to respond to your attached request? Yes, please go ahead and take a 3-week extension time. Do let me know when you have a response. Yes, consider the two weeks extension time granted. The City is continuing to process your attached request, but requires additional time to do so. Your request seeks a very large amount of records that are still being reviewed. Would you please grant the City an additional two (2) week extension, until 10/4/18, to process your attached request? Additionally, would you please provide me with your phone number so I can call you to discuss setting up a rolling production schedule? This rolling production schedule will allow us to provide you with records responsive to your request as they become available. I am curious of the status of responsive documents for this request. Please let me know via email or a call to the aforementioned phone number. Per our phone conversation, could you please confirm that you have agreed to grant the City a one (1) day extension of time, until 10/5/18, to respond to your pending request with our office, Ader #2077? Consider the one (1) day extension granted. Thanks for your update.